First U.S. Secretary of Labor. William B. Wilson was one of America�s most effective labor leaders in improving the living and working conditions of millions of workers in U.S. mines and factories. ■ He was born April 2, 1862, in Blantyre, Scotland. When he was eight years old, his family emigrated to Pennsylvania. Two years later at age 10 he was working in the coal pits, so he had little formal education. 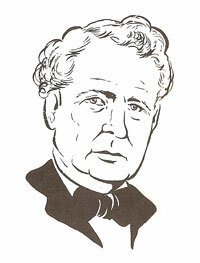 ■ During his years in the mines (1872-98) he spearheaded efforts to unionize miners. In spite of apathy, blacklisting, and frustration, he persisted in his efforts. ■ On January 25, 1890, in Columbus, Ohio, he helped to launch the United Mine Workers of America. He served as secretary-treasurer of the UMW from 1900 to 1908. ■ In 1906 he was elected a representative to Congress where he served for three terms as an aggressive champion of labor. He lobbied increasingly for measures favorable to labor including mine inspection, the eight-hour day, and organization of the U.S. Bureau of Mines. ■ He served as chairman of the House labor committee and advocated a separate cabinet-level department of labor. President Woodrow Wilson created such a department in 1913 and appointed William B. Wilson the first U.S. Secretary of Labor. ■ During Wilson�s term, the U.S. Employment Service was established and the Smith Hughes Vocational Education Act was passed. Wilson also pushed Congress to enact a literacy test for immigrants to discourage the importation of cheap labor. It was passed. ■ He served on the Council for National Defense during World War I and was a member of the Federal Board for Vocational Education. He died May 25, 1934, near Savannah, Georgia.